Your bedroom should be your very own sanctuary. A place where you can go to relax, wind down and enjoy your own company. Everyday life can be hectic, busy and often stressful and having your own space to escape to is ideal and very beneficial. The way you decorate your bedroom has a huge impact on the overall atmosphere within the room, so it’s important to focus on your décor and make sure it’s suited to you. With spring, almost upon us, here are a few different ways for you to brighten your bedroom’s décor and create the perfect space for you to enjoy. With the walls playing a very strong part in the overall look of your bedroom, its essential that they are fresh and bold. After a while, the paint or wallpaper can begin to look dull due to dust, sunlight and general wear. Focusing on your walls to begin with will instantly help you to brighten your bedroom décor and revive the atmosphere. 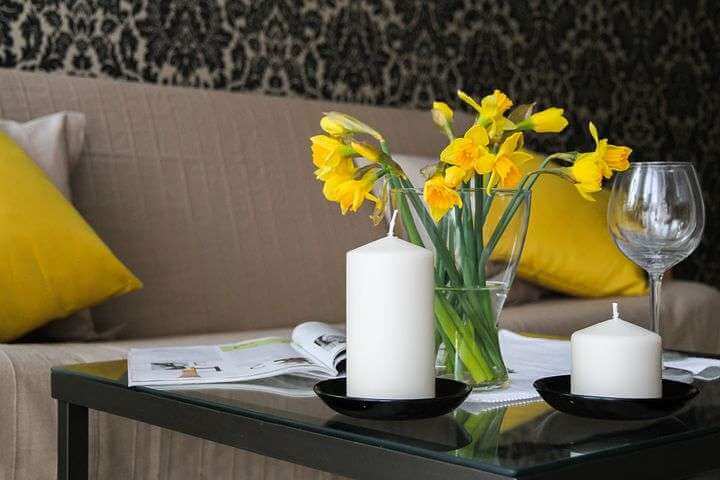 Try to avoid dark, dull colours as these will bring the atmosphere and make the room feel smaller and cramped. Sticking to a brighter colour scheme of colours that help to create a positive feel will ensure your bedroom feels welcoming, warm and relaxing. 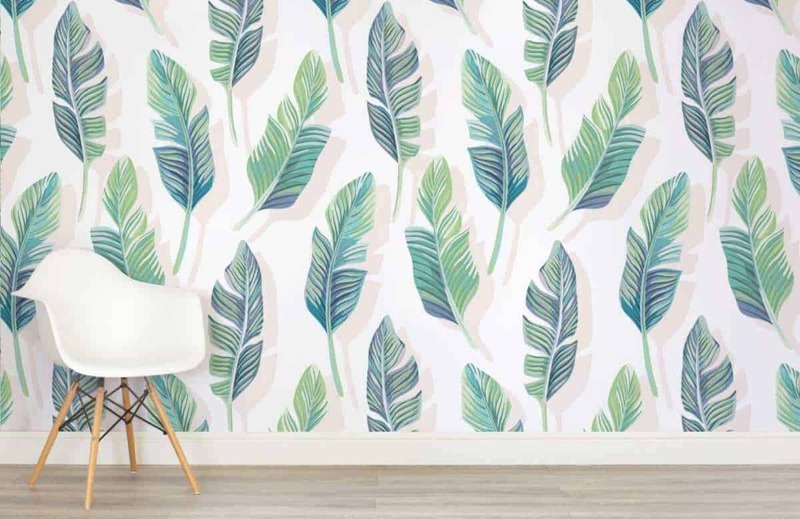 I love the white and green tropical leaf wallpaper from Murals Wallpaper. It is so refreshing. Choosing furniture for your bedroom is a really important process. The furniture you choose needs to be comfortable and suitable for you. One of the best ways to keep your interiors consistent and have a bright, fresh feel, is to stick to furniture pieces from the same product range. By sticking to one range you’ll notice your room will be drawn together perfectly. When it comes to the style of your furniture, opting for a brighter material or colour will instantly help to brighten your bedroom décor. Light oak furniture works very well when it comes to giving a delicate, bright and chic touch to any room. Similarly, white painted furniture will also create a fresh feel within the room and will be very easy to introduce brighter colours too. John and I have white furniture throughout our bedroom and it really does feel great to have a room with matching items rather than the mismatched items we previously owned. We didn’t have the money to buy it all at once so it took a while to collect one piece at a time but our room is so peaceful and relaxing and the choice of furniture certainly adds to this. It may seem like a strange décor tip, but by giving your windows a good clean you are enabling as much natural light as possible to flow through your bedroom. Natural light is ideal when it comes to interiors, as not only does is brighten the room, but it also creates a very positive atmosphere that will help you to wind down and relax. It’s not essential to clean your windows every week, but dedicating one or two times a month to giving them a good clean will really make a difference. You’ll also notice it adding a little kerb appeal to your home too! Your bed is one feature that takes up the largest space in your bedroom and is often used to create a bold focal point too. By dressing your bed in some beautifully bright bedding, you can create a stunning look and lift the atmosphere within the room at the same time. Incorporating bold colours such as pinks, blues, greens and yellows will add a fresh, spring/summer feel to the room and enhance your focal point. 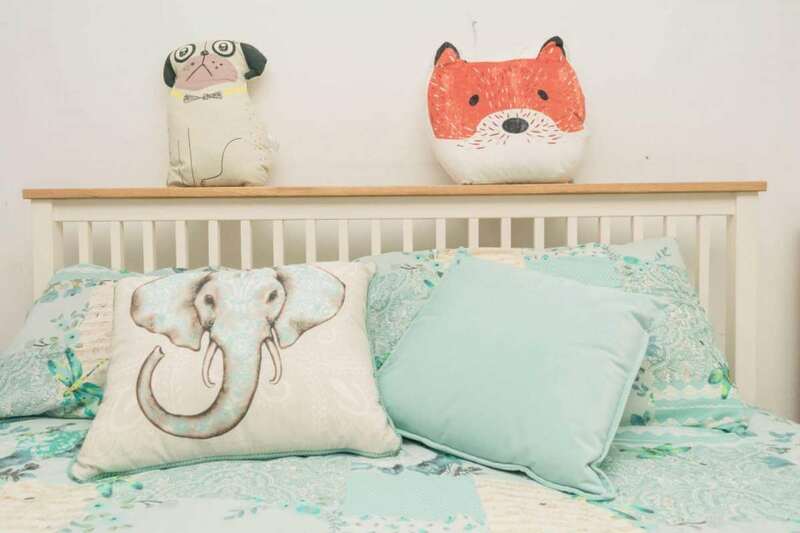 You can then look at adding some additional items to your bed such as scatter cushions and a delicate throw to emphasise the style and add character to your bed. You may want to check out my post on Styling the Bedroom using a colour selector. Finishing touches are so much fun to choose, especially when they’re for your bedroom. You can finish a room beautifully with some chic door handles and a stylish light fixture, adding extra character to the room and enhancing the current décor. For brighter, bolder interiors you can look at introducing shiny features such as curtain poles, lamps, mirrors and door knobs. The shiny, high gloss finish will reflect the light and create a brighter feel within the room. 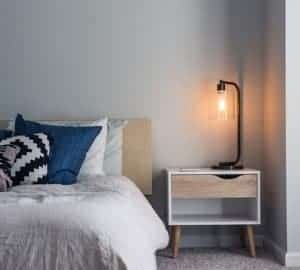 You can then add to this by placing some gorgeous, scented candles to your surfaces, giving your bedroom a gentle glow that will add to the relaxing, welcoming atmosphere. My favourite candles are Yankee candles. I discovered them after moving to the UK. They always make the room smell so gorgeous and bring a sense of peace and relaxation I simply love. The wall paper looks so good! might get something like this for my living room! and so true, bright furniture pieces definitely make the room look bigger and brighter! 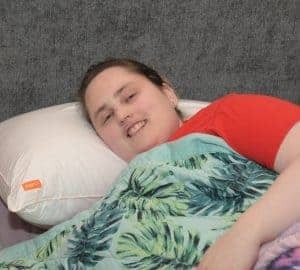 I don’t have a budget, but I’ve been thinking of finding some lovely colored sheets and pillow cases for the rooms to give them something new. It’s been since we moved here and it would be nice to have something different. i love this! Such a great way to freshen up a room. The wallpaper is awesome and I love the flowers too, I have them everywhere! I totally get how important it is for a bedroom to feel bright and airy. These are really good tips on how to accomplish this. Our bedroom has no windows, so it’s always dark. These tips could come in handy to brighten up the room some more. I love your tips for brightening bedroom decor. I’d love to brighten my bedroom walls. It always looks so dull with the plain white. I need to try your tip for my bedroom decor! These are great tips! We are still working on our house and I definitely want to make the master bedroom a sanctuary for my husband and I! We do need to update our bedding! It’s been there for years and isn’t colorful at all. I have always wanted a room with a nice print on it – the feathers are a really nice touch. I’d like to brighten my nephew’s room this summer by painting a mural. Color! I love adding color in my home especially in my bedroom. These are great tips, I’ve used some of them while decorating my room as well. I love getting ideas online on how I can improved our home. There is so many choices and sometimes it is quite overwhelming. Flowers are great..candles in the bath are fab too! I agree with these tips. The bedroom is my little sanctuary and I make it as cheerful as possible. I tend to stick to one color motif and use monochrome shades of the color I chose. Great idea with the candles too. I’m going to do that. Thanks Annemarie. I like monochrome too! 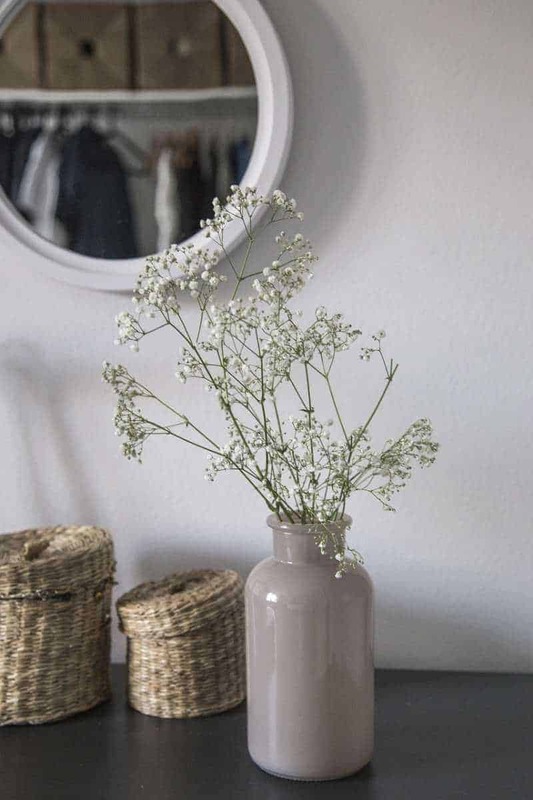 Baby’s breath is always a great choice- it looks fresh for SO LONG! Great ideas!